What's in your mailbox this week?? Leave me a link so I can check it out! Thanks for stopping by! Don't forget to enter my GIVEAWAY for Juliet Immortal! I still haven't read 'Beauty Queens' but it looks like so much fun. Anna Dressed in Blood looks amazing! I can't wait to read your review! I have Beauty Queens but I haven't got around to reading it yet! Great IMM! 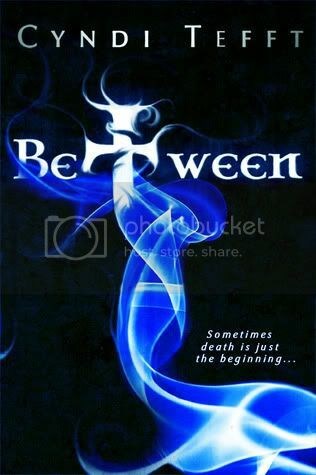 Between is really good! I hope that you enjoy your new books! I was so close to picking up Beauty Queens in B&N today! And Anna Dressed in Blood is on my TBR list. Enjoy! Jealous! Seems like a ton of people got Beauty Queens this week! Graveminder's on my TBR pile still.... Hope you enjoy them all! I keep picking up Graveminder each time I'm in the shops, but its priced a bit too high for my liking. I do like the the white cover we have for it here in Australia. Hope it's good. All your books look awesome! I loved Graveminder, and am dying to read Beauty Queens. Awesome mailbox! Yay for getting BEAUTY QUEENS! I've heard it's really good! I need to check it out soon. Anna dressed in blood i want to read so bad! The grave minders i want to read, but because its adult im nervous i wont like it and everyone keeps saying Beauty Queens is amazing so i feel like i should read it. If you haven't already, ENJOY! Anna Dressed in Blood looks amazing and I really want to read it soon. Hope you enjoy it. I really want to read Graveminder. I can't wait to hear more. I'm on the waiting list at the library for Beauty Queens and I'm also on the tour for Anna Dressed in Blood via ATW tours too. Happy reading! Graveminder is in my reading pile, sadly still untouched, and I so want Anna Dressed in Blood - lucky you! I've heard such good things about Anna Dressed in Blood! I can't wait to hear what you think. I really want to read Graveminder too! Enjoy your books! Congrats on your win - Beauty Queens sounds great! And love the look of Anna Dressed in Blood - happy reading :). Anna Dressed In Blood is high up on my wishlist - I'm glad to hear you're enjoying. Graveminder also looks like it will be an exciting read. Nice mailbox! Graveminder was awesome! Loved reading something so different from Melissa. Hope this becomes a series rather than standalone! Ive won a copy of Anna Dressed in Blood and I cant wait for it to come!! :D I hope you enjoy your books! Oooh Anna Dressed in Blood! I am excited to read that one too! Can't wait to see what you think. Great mailbox! Beauty Queens is on my reading list it sounds great! Happy reading! I bought Beauty Queens for my kobo ages ago and haven't gotten around to reading it yet! I hear it's great!! Anna Dressed In Blood!!! Cannot flipping wait to read that book, it sounds SO GOOD. I'm interested in checking out Graveminder too, since I enjoyed Melissa's fey series. LOVE Beauty Queens, it's absolutely hilarious :D Have fun reading! Fab set! 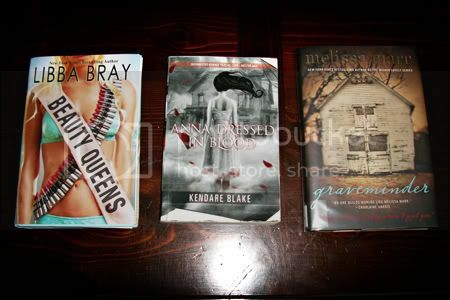 I so want to read Beauty Queens and Anna Dressed in Blood. Hope they're great. I've seen Beauty Queens around a lot these past few weeks. Looks really good! Definitely seems like some great books! Very happy for you. :D I also got some books I'm hoping will be pretty awesome! 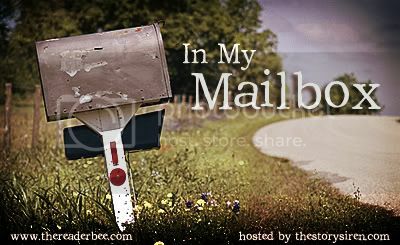 Click to see what I got in my mailbox this week! I got Beauty Queens last week, but still haven't read it! I want everything on here! Between looks great, but I love the cover to Anna dressed in Blood. I was never a fan of Marr's fairy series by Graveminder sounds scary and Beauty Queens just sounds funny! Beauty Queens was pretty good, though not my fave. I'm reading Anna Dressed in Blood right now and loving it so far. Enjoy your books! You got a nice list of books this week in your mailbox. I have heard a lot of good things about Beauty Queen. beauty queens i've been wanting to read. enjoy all your books and thanks for stopping by! AHH! I so need ANNA!! Sounds wicked! hope you enjoy them all! happy reading! Looks like some great books! I'm especially excited about Beauty Queens! Haven't read it yet myself, I hope to hear it's good! I can't wait for Anna Dressed In Blood. It looks super creepy!! I read Graveminder. It was really good. I hope it's a series. Enjoy your books! So jealous of Anna Dressed in Blood - I can't wait to read that one! Graveminder is on my TBR list... :) I just hope it's not as scary as I think it is.. I've heard really good things about Anna Dressed in Blood. I can't wait till I get a copy! I loved Beauty Queens so much! I'm excited for Anna Dressed In Blood. I've heard GREAT things! You are so lucky! I'm incredibly jealous. I want an ARC of Anna Dressed in Blood as well! Lucky you!